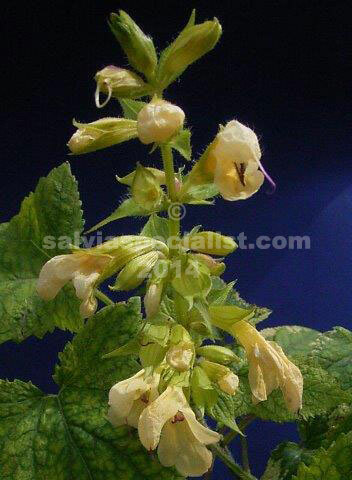 The first salvia nipponica we got into Australia was a variegated one marketed as ‘Fuji Snow’, the flower is the usual lemon colour for nipponica. Oddly this plant was not called ‘Fuji Snow’ in Japan, its country of origin. Probably got here via the United States and gained a name on the way. Variegated plants are slow at growing because of the lack of chlorophyll in the yellow leaves so I don’t usually have a lot of this plant. It is low to the ground, winter dormant and cold tolerant, but not drought tolerant. Most Japanese salvias grow on or in streams. 25cm high. Propagated by division. There is also nipponica trisecta which has very cut leaves. If you want a lemon flowered shade lover I recommend S. koyamae to be a much stronger growing groundcover.